Description; "This bottle has some small light touch marks, and light scratches, and a few small flea bites one on top edge." It also goes on to say; "Extremely Rare Historic Calvin Kellogg , C.W. 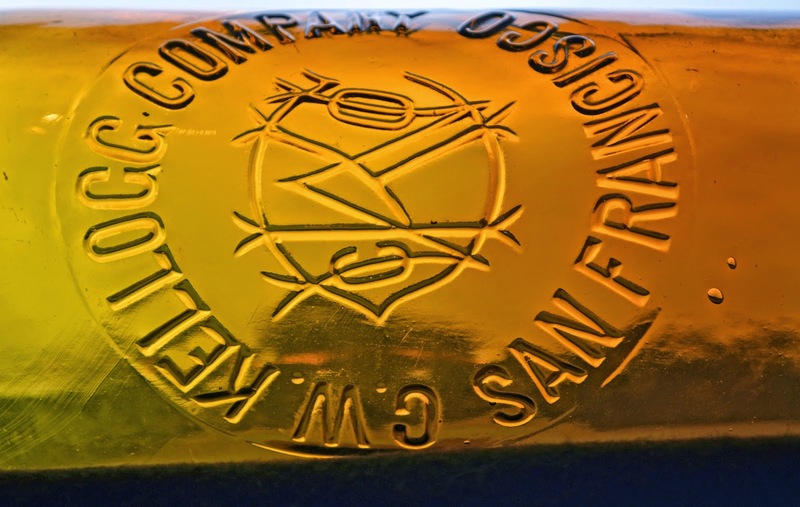 KELLOGG COMPANY Monogram Tool Top Western Whiskey San Francisco Bottle! A Hall of Fame - Collectible Bottle! This is a once in a lifetime opportunity to purchase this Rarity!" I got an email from a fellow collector who noticed the same bottle on our Spring list which just went out. He wondered if there was a mistake on either the eBay listing or mine, since there is such a disparity in value. The firm of C. W. Kellogg first appeared in the 1897 S. F. Directory. They were listed as wholesale liquor merchants and were located at 122- 124 Davis in "The City". The following year they relocated to either 404 or 404 - 406 Sansome, depending on which directory you look at. There is some confusion as the business listing only shows 404 Sansome St., whereas the main directory lists both 404 and 406. The listing for the firm appeared in the city directory's from 1897 - 1900, and then vanished as quickly as it appeared. Oddly enough, Calvin W. Kellogg had died a couple of years prior to the appearance of both the firm and the bottle that bore it's name; on April 12th, 1894. As a sidebar, we noted that in 1892 C. W. Kellogg became involved in the mining frenzy that was sweeping the west coast with a renewed fervor. Apparently a diversion from the wholesale liquor trade that had previously consumed most of his adult life. Here's a couple more juicy tidbits gleaned from the pages of the San Francisco Call. Back to the firm and the bottle; based on the newspaper articles that we found, the firm was destined for failure by the time the doors first opened. Financial problems had plagued Kellogg, the family members, the estate, and apparently most people that old C. W. had come in contact with as well. As mentioned previously, what a soap opera. The bottle itself is scarce. We can account for maybe 6 in any condition. And although it's a fairly late bottle, the one that I have is actually fairly crude, with a touch of whittle and some big swirls throughout. The body is air vented at the shoulders but there is no evidence of venting in the embossing or the margin of the slug plate. The base mark is one that I don't recall seeing before; either an "O" or a zero. As far as the who's who in the C. W. Kellogg Company goes... I was unable to locate anything that would pinpoint whether the son (Edward E. Kellogg), the daughter (Ella Gilroy), the second (Rispa D. Kellogg) or the third wife (Mary Emma Masey - Kellogg) was actually the controlling party. I also see a footnote that Joseph M. Lowe was part of the legal dog and pony show. Frankly, my bet is on one of the two wives; see the 1900 listing. My money is on Mary Emma Masey - Kellogg, assuming that the courts allowed her to remain in the O'Farrell St. home. It is also not altogether impossible that Lowe was somehow involved. Until a paper label, a letterhead, an invoice or something tangible surfaces, the mystery will remain just that. To answer the original question, is it really worth $7,000.00 (or $5k or now $3800~)? As I've said before, I guess that a bottle is worth whatever someone is willing to pay. Interesting bottle Bruce, and interesting history of C.W. Kellogg as well. I turned 70 years old last Sept., and I had a good chuckle after reading the article where they referred to the 70 year old Kellogg as "the old man" and the "ancient spouse". I think my kids consider me as the old man now, but I hope that I have not reached the pinnacle of "ancient"!